On your special day all your friends and family have gathered to celebrate the Mr. and Mrs. with hugs and kisses. 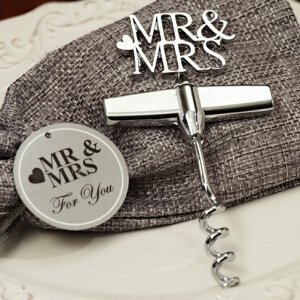 Our Stylish design Mr. and Mrs. wine opener favor will give that special added touch to your elegant affair. 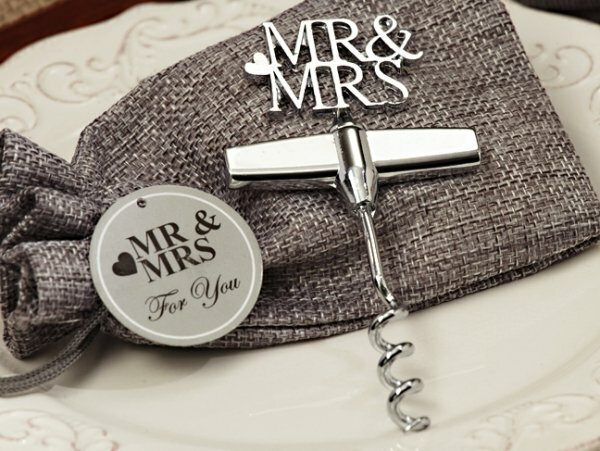 Each Silver chrome metal topper is carved into Mr. and Mrs. design and attached the a chrome corkscrew base . Each measures approximately 5" x 2" and comes ready for gift giving in Burlap gift bag and item comes with a matching For You tag attached.